Last month I had the privilege of being apart of the very first Refreshingly Real Farm-to-Can Tour event right here in Indianapolis. 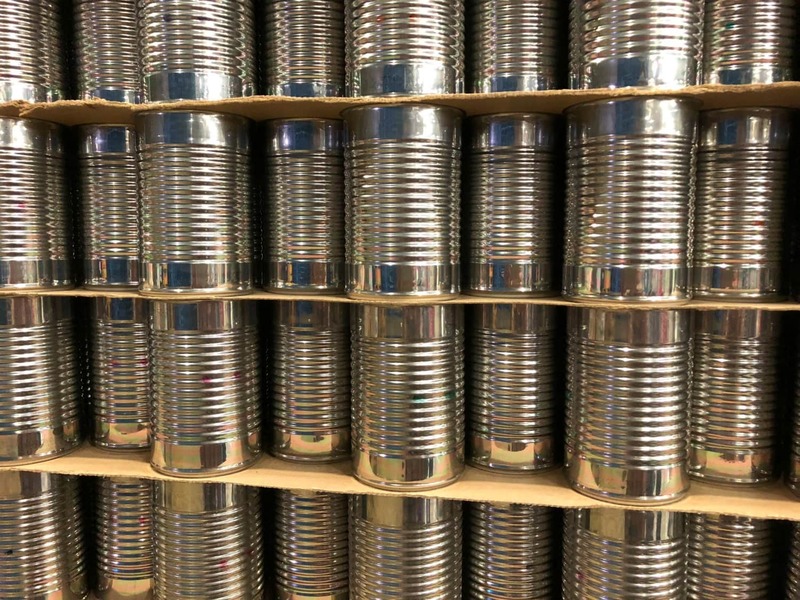 The event was filled with adventures where we were able to see the journey of the cans of food (and beer) that we all have in our pantry. We learned a lot about canning from food experts, a dietitian, a brewer, and even a chef. We even learned the answer to this common question. Thank you to Refreshingly Real and the Can Manufacturers Institute for sponsoring this post. All opinions are mine. So let’s get down to it. Are canned foods healthy? The short answer is absolutely! The actual canning process allows food to be at their peak of ripeness so they lock in their nutrients when they are at their prime. We all know that as food age they lose some of their nutritional value so it is imperative that they are packed quickly. In fact, the tomatoes we saw at the farm are picked, shipped and canned within 4 hours! 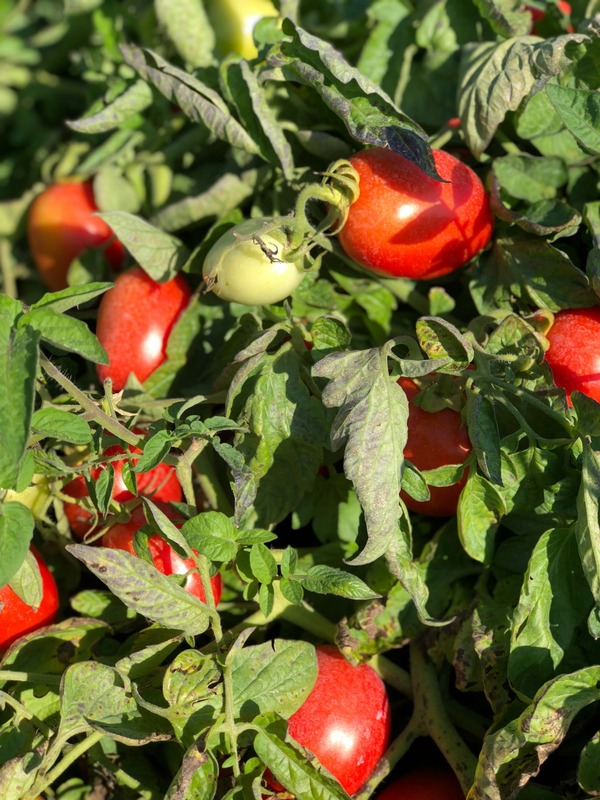 Did you know that canned tomatoes contain significantly higher quantities of lycopene than fresh tomatoes? Lycopene is an essential phytonutrient that can help prevent diseases and help with eye health among other things. Canning also ensures that our foods are not contaminated and are safe for our families. They are a great time-saver for busy parents to get healthy and nutritious meals on the table quickly. While it took 4 hours for these tomatoes to find their home in a can, I have shortened the process into a quick 2-minute video. 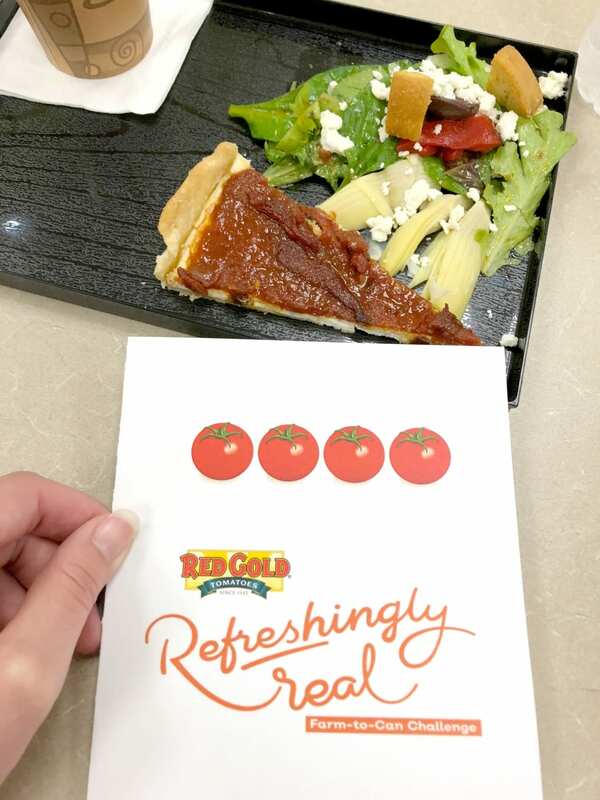 I was impressed by the amount of care the employees at Red Gold give these tomatoes. 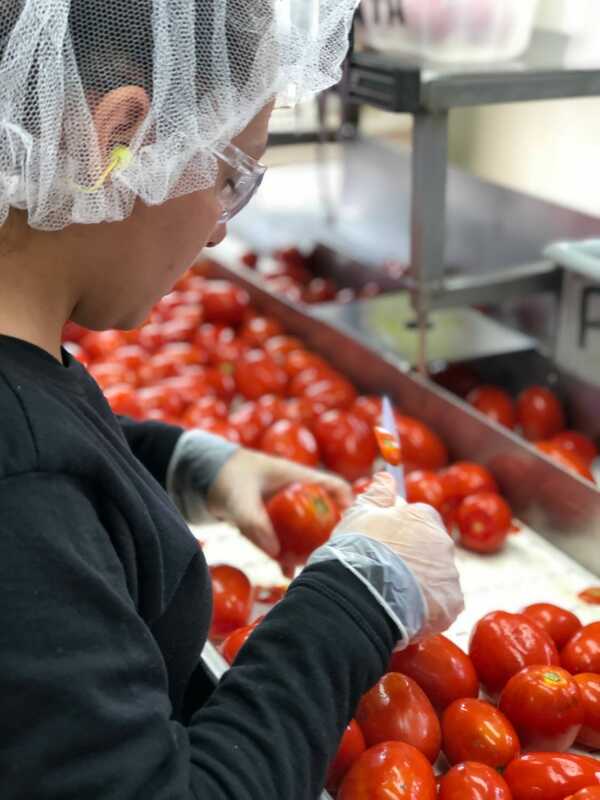 To ensure that only the best tomatoes make it into a can of Red Gold Whole Peeled Tomatoes, the tomatoes are hand inspected several different times starting when they first arrived from the farm. 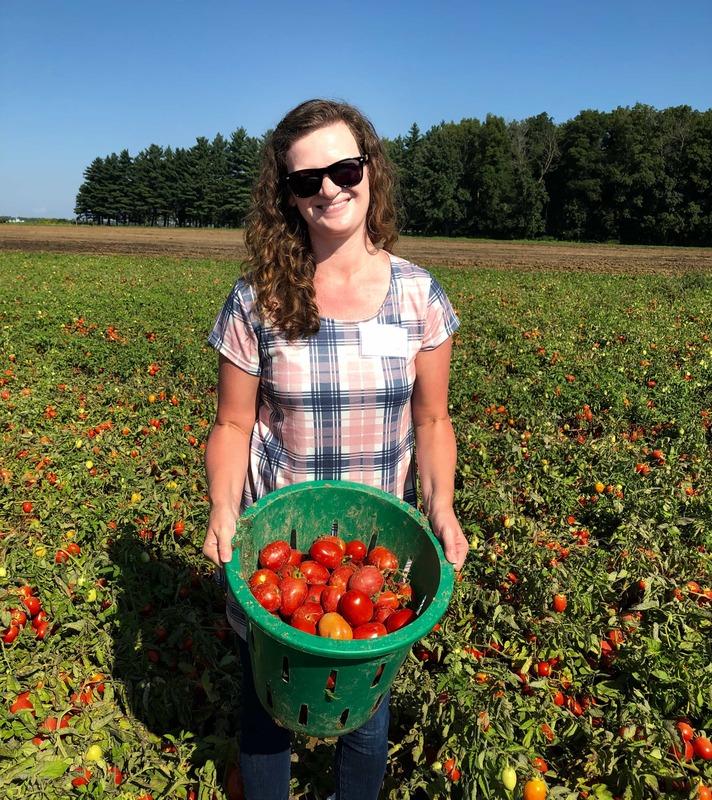 Seeing the entire process of canning tomatoes was an eye-opening experience. 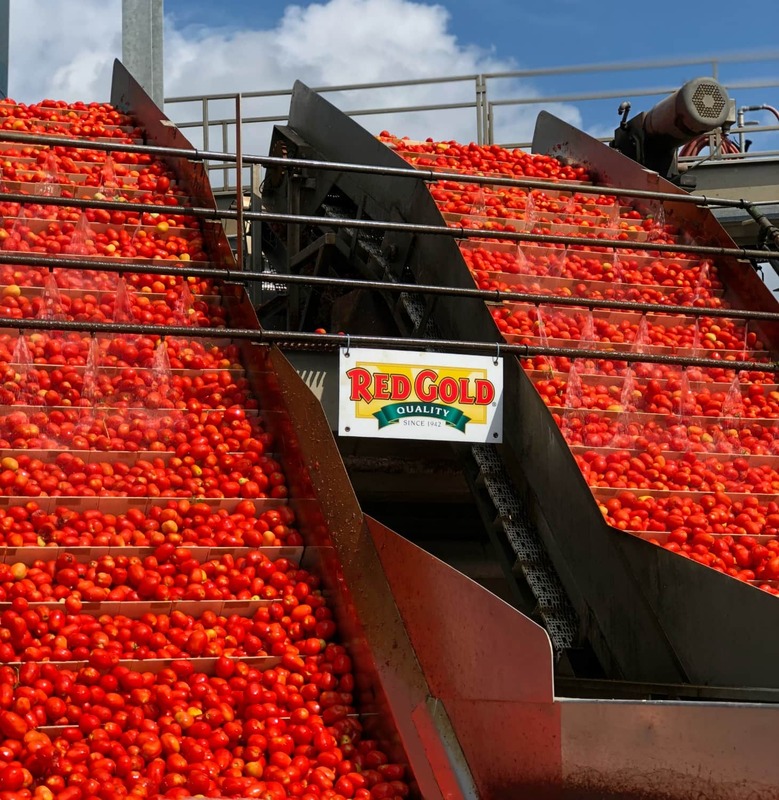 Red Gold is the largest privately-owned tomato and canned tomato food processor in America. It is family owned and operated by the Reichart Family. 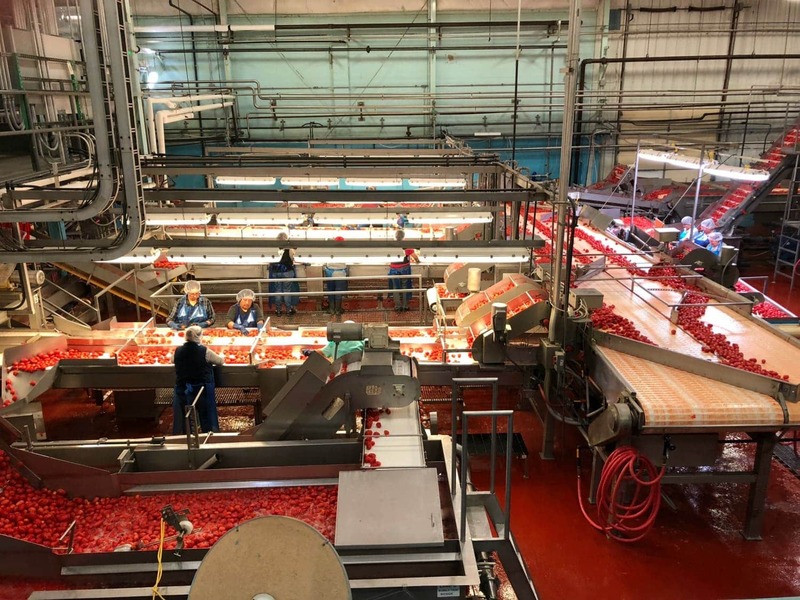 While their three facilities operate year round, they only produce canned tomatoes, tomato juice, and some sauce products in late summer during their peak freshness. This is only a 10 week time period and in order to harvest them, they work with local farmers within a 200-mile radius from their plants. One of these farms is Triple S Farms in Windfall, Indiana. 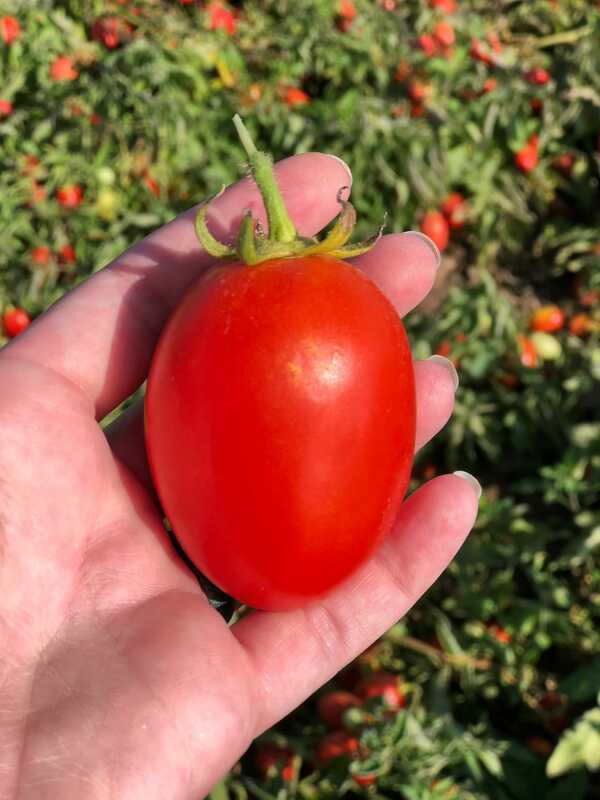 We were treated to a tour of the tomato fields at Triple S Farms. This farm is a fourth-generation family owned farm. Scott and Terri Smith grow corn seed beans and tomatoes. While we were there we were able to watch them harvest tomatoes that were being shipped to Red Gold for canning. 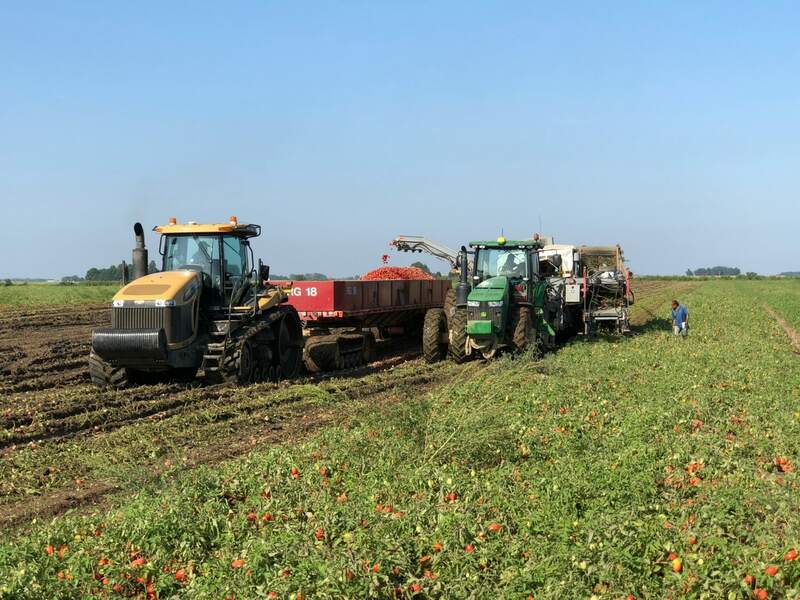 I had a lot of fun stopping around in the mud (Indiana had gotten a lot of recent rain) and watching the picker grab the tomatoes and fill up the truck bed. I was pretty impressed with both Red Gold and Triple S Farms. Their attention to detail and their love of what they do was evident during our visit. They have built businesses that strive to do better and their passion is contagious. After my visit, I was convinced that feeding my family canned food is a no-brainer. 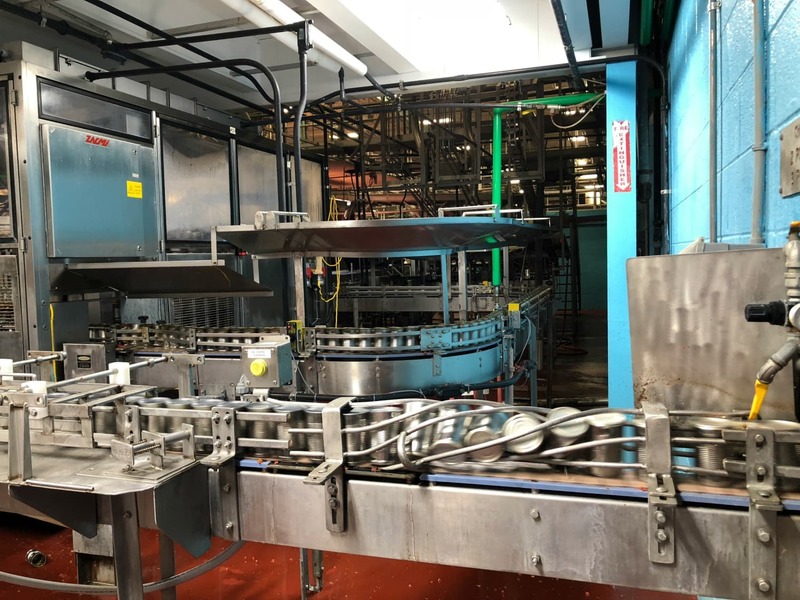 Our Farm to Can Tour not only consisted of watching tomatoes being processed, but we also got to see how our favorite canned beverage, beer, was made! 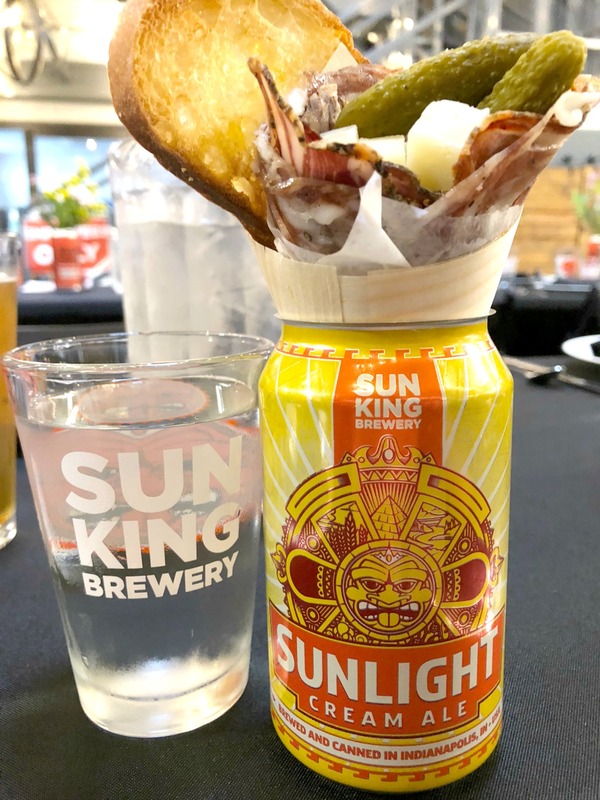 During our time at the Farm to Can event, we learned why a business such as Sun King Brewing prefer to can their product instead of using other methods. The can actually protect beer from sunlight and air, unlike bottles, so that the contents are better preserved. My favorite beer of all time is The Sunlight Creme Ale from Sun King. 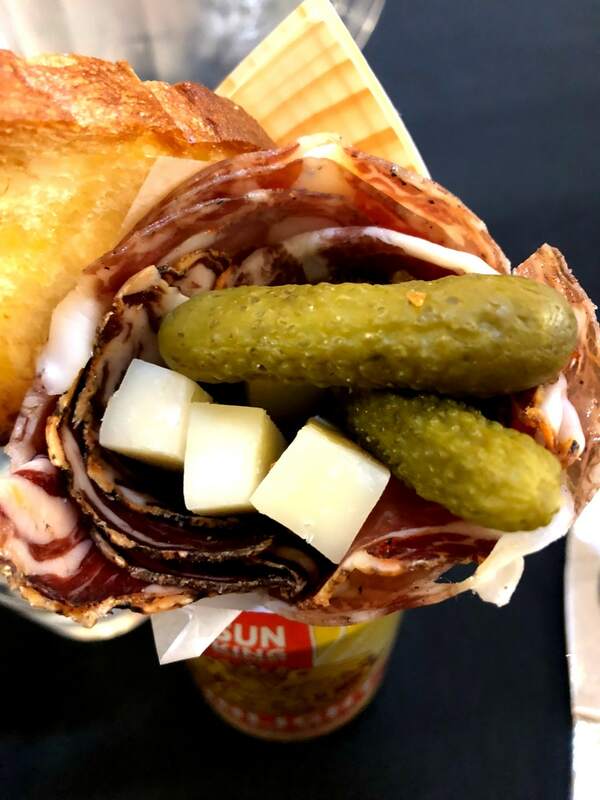 When we had our dinner at the brewery they found another way to utilize this amazing beer, by putting it in a cheese dip and by using their cans for a charcuterie appetizer. I am now convinced that charcuterie cans are THE PERFECT FOOD! Canned food is nutritious, convenient and affordable. Using canned food helps us waste less food while being environmentally friendly. There are so many benefits to eating canned food, and busy parents like ourselves should take advantage of it. I love using canned food in my cooking. We use canned beans in our Blue-Ribbon Chili as well as our Walking Taco Recipe (made with Red Gold diced tomatoes). Over the next few months, I will be sharing more recipes using canned food products, be sure to come back and check them out. Overall, I was really impressed with my time at the Refreshingly Real Farm-to-Can Tour. I loved learning new recipes and the benefits of canned foods. Rest assured that I did find out the answer to our question, Is Canned Food Healthy? I can confidently say, absolutely!